Rowena has been running EFT training courses for over 16 years and is considered an expert practitioner with a wealth of experience, she is currently working alongside Dr Rosy Daniel who is a holistic Dr in Bath and refers her cancer clients, those with serious illness and those with emotional issues to Rowena. Pre-requisite is one year’s experience as an EFT Advanced Practitioner and a Member of AAMET for at least one year. AAMET are currently updating the criteria to become a Master Trainer of Trainers, we should have further information shortly and I will update this page. The Master Trainer Training will be delivered over 4 days or two week-ends. There will be pre. course material and post course material. This course is for those who wish to train others in EFT. The course will lead to accreditation and certification as an EFT Master Trainer. For application form please contact me. The overall aims and objectives of the course are to equip students with the skills and knowledge to design, deliver and manage effective EFT Training courses. Work together with an AAMET Master Trainer of Trainers and complete all AAMET and discretionary practice and assessment criteria as set forth by AAMET and the Trainer of Trainers in the role of Supervising Mentor. 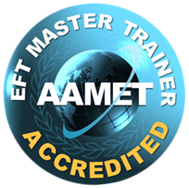 Once the Accreditation Panel has received notification that a student has passed the Master Trainer exam and completed all requirements and received the signed Contract, AAMET will award a Certification of Accreditation at Accredited Certified EFT Trainer (NQT) level. 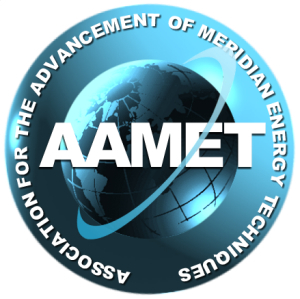 All Newly Qualified AAMET Trainers can list themselves as “AAMET Trainers (NQT)” and will be listed on the aamet.org website as “AAMET Accredited, Certified Trainer (NQT)” until they achieve full Accredited, Certified Master Trainer status. Newly Qualified Trainers can apply to AAMET for full Master Trainer status after aptly demonstrating (within their first year as a Newly Qualified Trainer) they can train EFT to Levels 1 and 2 in a competent, professional and committed manner. The following criteria are included in the Application form for upgrade to full Master Trainer status and must be met before the upgrade can proceed. All candidates for upgrade from newly qualified (NQT) to full Master Trainer status must have delivered at least two training courses at Level 1 and two training courses at Level 2 within the provisional period, all of which must be for groups of 2 or more students. One training course can be sufficient at each level if there are more than 6 participants in each training group. Must provide a valid CPD and Supervision record for their provisional period including comments and a recommendation from the Accredited Master Trainer of Trainers who is acting as Supervising Mentor. Must shadow or co-train with a more experienced trainer through at least 1 training course and write a reflection on this experience as part of the recorded CPD. Must have completed any actions that were asked of them at the time that they were awarded Newly Qualified Trainer status. A report from your Master Trainer and Supervising Mentor summarising the work done together within Supervision sessions and training sessions. On completion of satisfactory criteria approved by AAMET a Certificate will be issued as an Accredited Certified EFT Master Trainer.